March is about All Things Art! Accordingly, we tackled a cool craft and created this stellar tutorial using items from the Bookmans gallery. With just a few supplies we made a funky jewelry holder that would look perfect in the Geller-Green household. We went with a dinosaur because dinos are cool, but any plastic toy of the right size and with space for hanging rings, bracelets and necklaces can be used to make this jewelry holder. 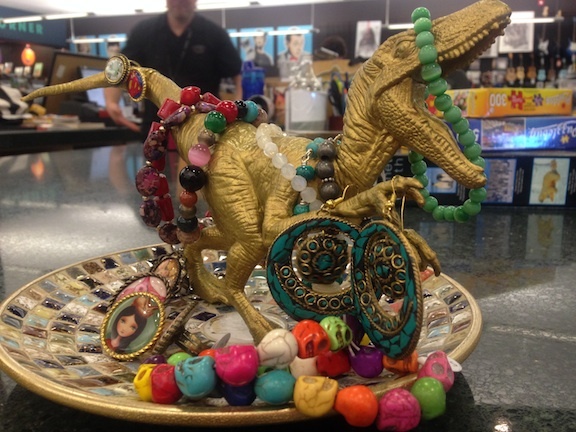 The main supplies listed in this dino jewelry stand tutorial are interchangeable and can be found at Bookmans. You likely have the rest on hand. 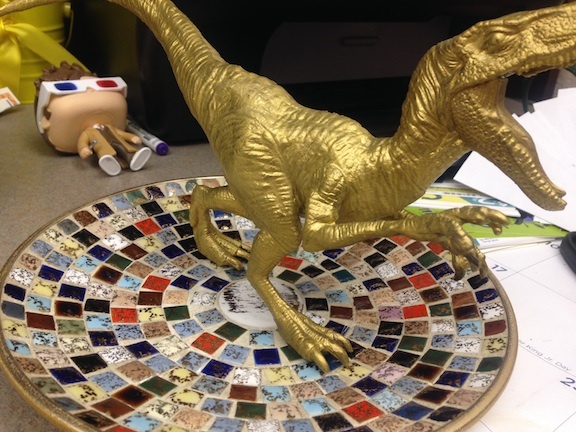 The Vision: We chose a Velociraptor because it’s Jurassic World’s most intelligent dinosaur. We chose a plate from the Bookmans Flag Gallery that had gold accents and cool ceramic tiles. The raptor’s long appendages and the plate’s gentle sloping sides are perfect for holding rings and bracelets. 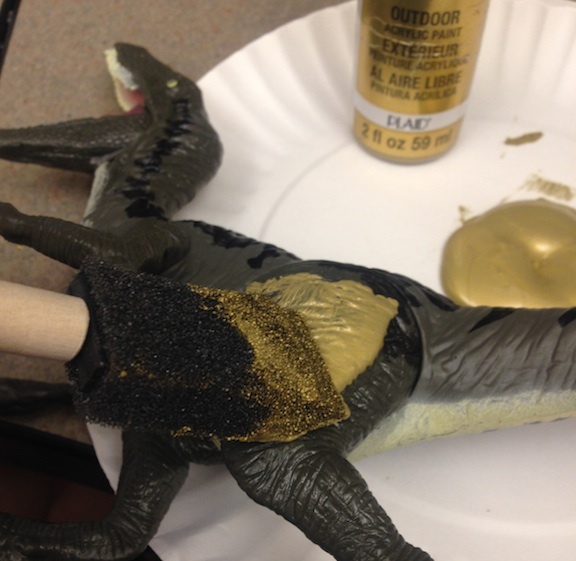 The Paint: Cover your plastic toy in gold paint. Bright colors like hot pink or electric blue also make a bold statement and would look great on your dresser. You can use any color. If you’d prefer the natural world, leave the toy as is. If you choose to paint, we suggest doing multiple coats. 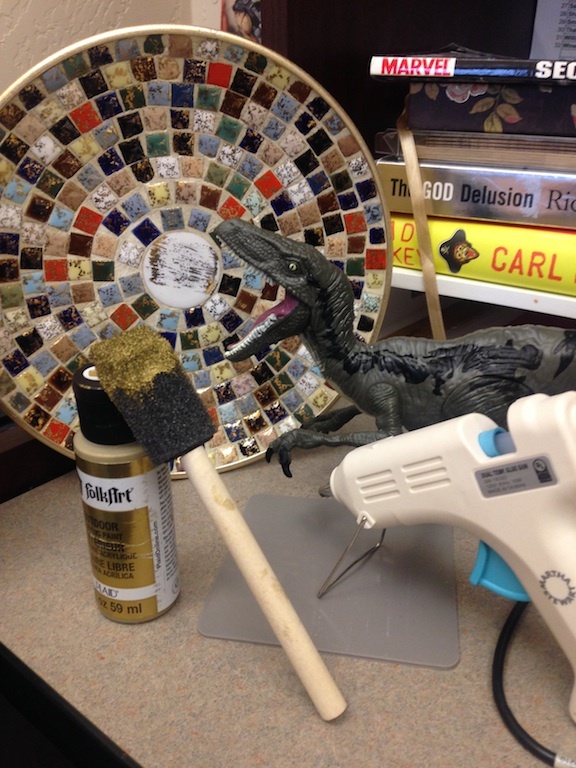 This velociraptor required three coats to cover the color variations. The result is super shiny. The Placement: After the glue has dried, which shouldn’t take to long, place your new jewelry holder on your dresser or vanity and drape that sucker in jewels. If you are lacking jewels, which is totally cool, use it for your keys! We do have one warning for those of you planning on using a velociraptor. The name “velociraptor” means “swift thief” so watch your valuables closely if you plan on letting that joker have access. All Things Arts month is underway. Join us at any of our free events this month and celebrate this arts!